Ofcourse the famous Simo, he was such an amazing person who helped us with information. The hotel is close to the champse and cafes. Love love love it there. 1- Receptionist at the top of the progress in dealing with literature and respect. Also, advises us. 2- Hotel is very secure and security. 3- location is great and everything is nearest. 4- Always room is cleaning. Location, service, friendly staff, great rooms. We were extremely pleased with the villa and will be back on our next visit to Paris. Room was ok by Paris standards but the bed was a double size, not a king as advertised. Bathroom very small. Tiny shower with ackward step up. Staff was friendly, very accommodating and professional. Lock in a great price for Villa Saint-Honoré – rated 8.4 by recent guests! 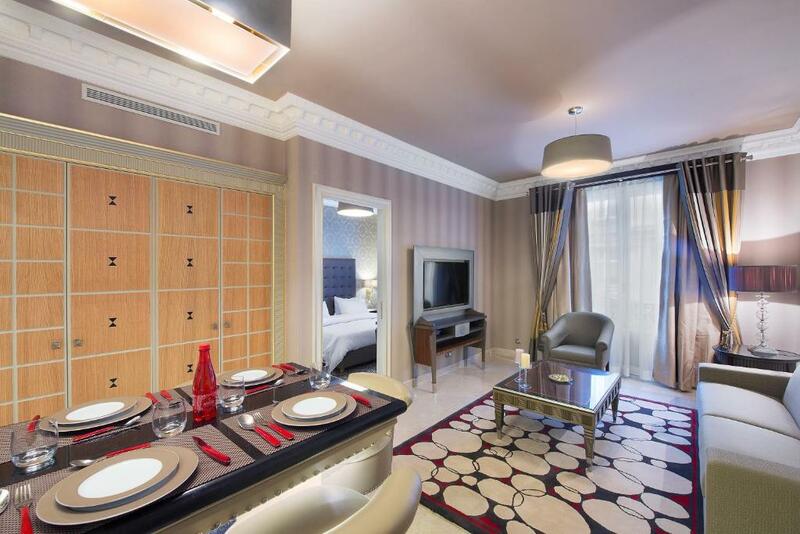 One of our top picks in Paris.Featuring free WiFi and air conditioning, Villa Saint-Honoré is located in Paris, 0.8 mi from Arc de Triomphe. Opéra Garnier is 1.1 mi from the property. Studios and apartments feature a cable flat-screen TV. A private bathroom is provided with bathrobes and free toiletries in each unit. All the accommodations types are located on the upper floor and can be accessible by elevator. Tuileries Garden is 1,500 feet from the Champs-Élysées Avenue and 650 feet from Rue du Faubourg Saint-Honoré. A public parking is available next to the property. When would you like to stay at Villa Saint-Honoré? 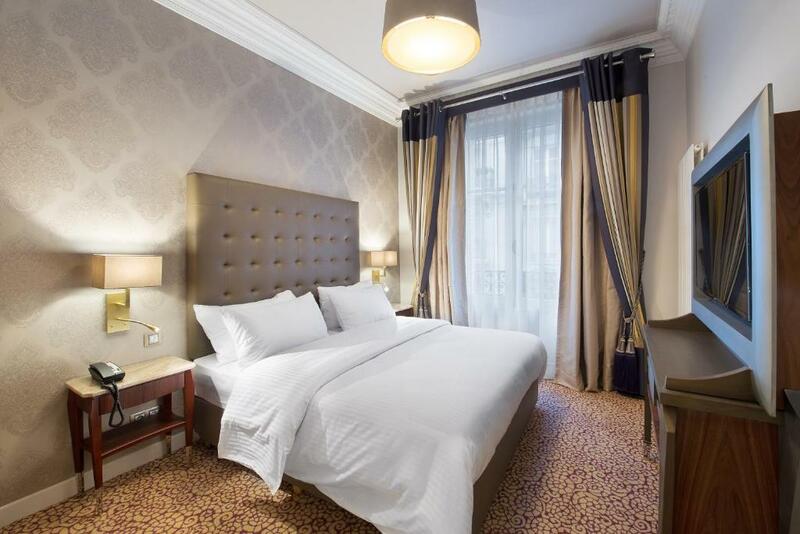 The Villa Saint Honoré is located on rue Saint Philippe-du-Roule, a quiet Haussmannien style street at the corner of rue du Faubourg Saint Honoré and, just a few steps from the Champs Elysées. 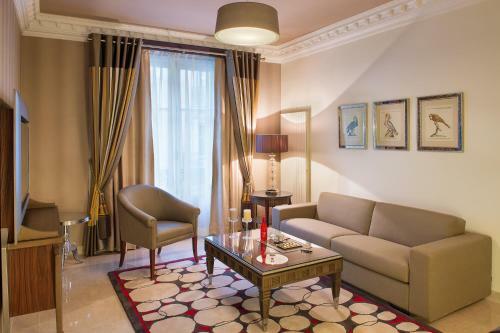 It enjoys a prime location with easy access to the best the city has to offer so you can fully experience the stylish and vibrant ‘art de vivre’ of Paris. Take a stroll from the Villa and immerse yourself in the radiance of the Tuileries Gardens, the Grand Palais, the Place de la Concorde, the Louvre, the Seine with its bridges and bookstalls and you too will discover why “Paris is a moveable feast”. Be it for a short-term or long-term rental, the Villa Saint Honoré offers you luxurious and impeccable accommodation. Defined by its elegant, comfortable and stylish interiors as well as its high level of services, the Villa is pleased to welcome you for however long you wish to stay. 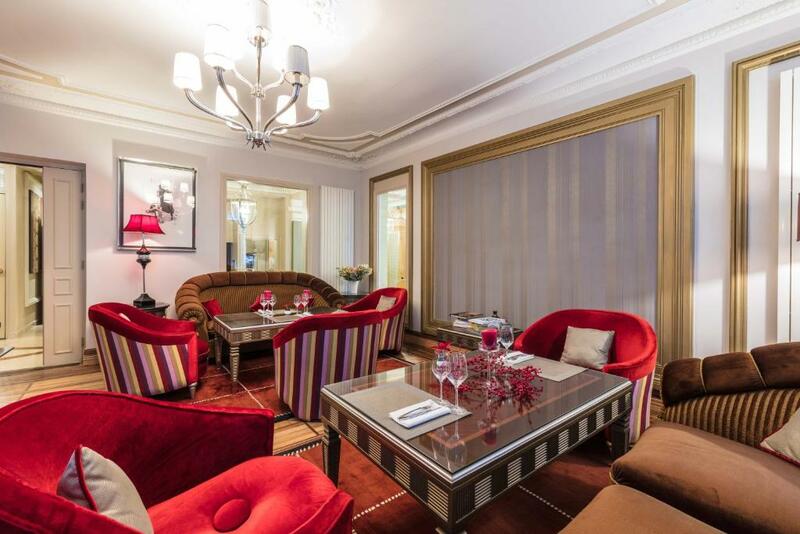 Whether you are coming to Paris on a business trip, a romantic escape or to entertain the privilege of a long term residence in Paris at the Villa Saint Honoré, let yourself be pampered and inspired and enjoy its peaceful, luxurious and voluptuous atmosphere. Welcome! Cleverly and harmoniously laid out, combining chic, modern style with art deco details, the luxury apartments at the Villa Saint Honoré offer a unique experience of elegance and wellness in Paris. 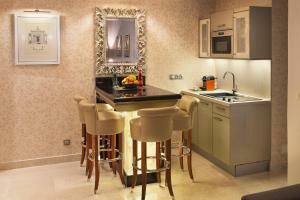 Our apartments are furnished with the finest materials and accouterments. 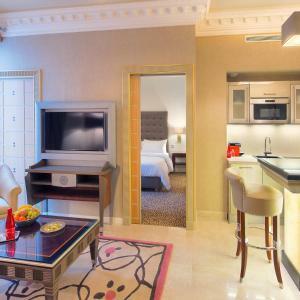 All are equipped with Queen or King-size beds and modern furnishings. All apartments boast a refined marble bathroom with either walk-in shower or stand-alone bathtub and luxurious bathroom amenities. Equipped with the latest technology, you can easily access free high-speed internet and Wi-Fi from any room in the apartment. A fixed line is also at your disposal with free calling to 40 countries around the world. All living rooms and bedrooms are fitted with high definition flat screen TVs, with free access to a large range of international channels. 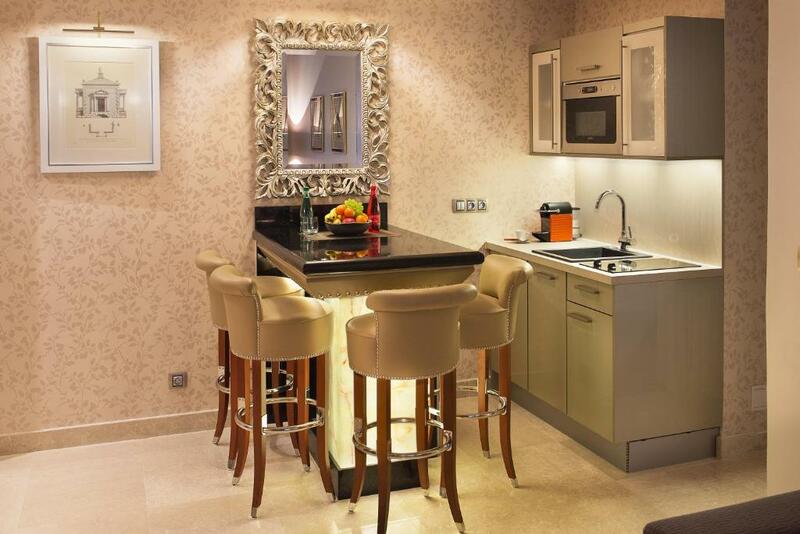 All our apartments are fully soundproofed and equipped with a small functional and fully equipped kitchenette with top quality appliances and utensils. 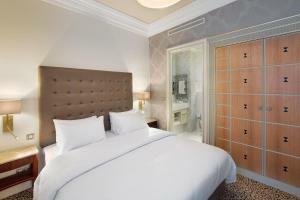 The Villa Saint Honoré is located on Rue Saint Philippe-du- Roule, a quiet street on the corner of Rue du Faubourg Saint Honoré and just a few steps from the world-famous Avenue des Champs-Elysées. This prime location provides easy access to the best the city has to offer so that you can fully experience the vibrant ‘art de vivre’ of Paris. Take a stroll from the Villa and immerse yourself in the radiance of the Tuileries Gardens, the Grand Palais, the Place de la Concorde, the Louvre Museum, the Seine River with its bridges and bookstalls . . . You too will discover why “Paris is a moveable feast”. Area Info – This neighborhood is a great choice for travelers interested in shopping, romance and food – Check location Excellent location – show map Guests loved walking around the neighborhood! House Rules Villa Saint-Honoré takes special requests – add in the next step! Villa Saint-Honoré accepts these cards and reserves the right to temporarily hold an amount prior to arrival. 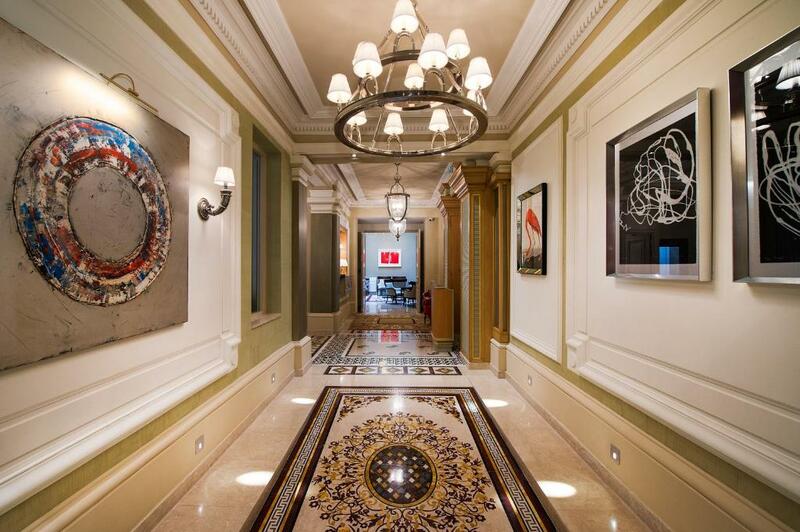 Please inform Villa Saint-Honoré of your expected arrival time in advance. You can use the Special Requests box when booking, or contact the property directly using the contact details in your confirmation. Upon arrival I considered leaving even though the room was prepaid because of the stench of male urine. It smelled as if people were using the lobby as a urinal. The smell was somewhat subdued by morning but a really poor introduction. I was frankly worried about what I would find next. The receptionist needed to run my card for three different payments which apparently could not be run together: the guarantee, a local tax and a different local tax. Very time consuming and hard to understand. The heat was overwhelming but opening a window solved the problem. But regardless of the comfort of the room, there was no hot water - this no way to give good marks. One can do better. The property is well situated. The staff was helpful and friendly. Despite an extremely smelly lobby, the room was extremely clean. Bed comfortable. Location is just alright, nothing special. I went for business, but travelers would find themselves very close to Arc de Triumph, as you will have noticed. The neighborhood is kind of dull. Just by accident I found myself a brassiere for breakfast - very French joint and perfect to start the day. The only thing I was missing was some cooking utensils but I asked and they provide me some. Regarding the gym, I was missing some free weights to workout. The personal was friendly and servicial they were always smiling and kind. The room had a small kitchen and toiled and the bed was super comfortable. Also, for the people that likes to workout when travelling, the gym was provided with brand new Technogym equipment, hard to find in that area.. Overall, I highly recommend this Villa. Would like to have the breakfast buffet / restaurant. We took breakfast around cafes and in Hotel Bradford across street. The styling, decor and cleanliness reflected the excellent location. Service is excellent. Overall very comfortable stay.